With pleasure I present to you Minister Sayon Mayson, Liberia’s Gospel Artist of the year 2013-2014. With this, you now know that he is the biggest Gospel artist our nation can boost of at the moment, at least as per the choice of the Liberian Association of Gospel Musical Artists (LAGMA). 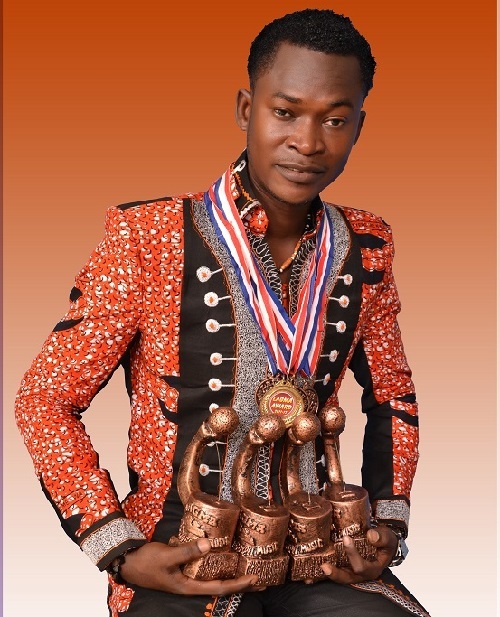 The christian association of all Gospel musicians in Liberia bestowed upon the young artist that highest national title on March 30, 2014 during its Annual Awards Night. Minister Mayson is currently most famous for his thrilling testimonial song titled “Jehovah Bless Me”, one that eventually earned him the award. Additionally, he won four other awards as he was also voted the Best Gospel Artist, Best Male Vocalist, Best Song, and Best Male Artist during this year’s annual event. He was nominated in all four of the categories and went on to win all including the coveted one ‘Artist of The Year’. “I just give God the glory for his blessings. For that song ‘Jehovah Bless Me’ which continues to make so much headways, I honestly never expected it to be such a boom”, the tall-slim young artist stated. room and began to think about where He has taken me from, where He has brought me and where He is taking me. So I just decided to praise Him in my room and that is how the whole song came about. I sang this song to just appreciate God”. But prior to his national award, Minister Mayson’s recognition had been gone international. He was one of two Liberian Gospel artists who for the very first time were nominated by the prestigeous internationally acclaimed Africa Gospel Music Awards (AGMA’s), the other being awards-winning Kanvee Gaines Adams. The 4th edition of the AGMA event nominated and placed Mayson among other top-notch African Gospel Artists in the category Best Male Artist of West African For 2013 that was held in London, the United Kingdom in July of last year. Though a late invitation and a 15-day visa issuance restriction coupled with Mayson’s ongoing academic exams at the time all prevented his attendance of the event, Mayson’s touching Gospel music continues to touch lives the world over. With special acknowledgment to Mr. Nathan Reeves whose sponsorship has helped him through God’s grace, the artist who is working on his third 8-tracked album seeks additional assistance and sponsorship to make his dream a reality: “I even want to have a bigger musical show to bless God, though I had a thanks-giving concert in my church a few Sundays ago”. especially among Diaspora Liberians in the United States, Australia and Europe. Beginning at the tender age of nine, a smaller, leaning Mayson would be made to stand on the bench to sing among people in various churches and school campuses. Though born in Monrovia with parents named Mr. Maxwell Mayson and Mrs. Oretha Vah (deceased), he hails from Grand Bassa County where he schooled at the Bassa Community School (BCS) and the WPL Brumskine United Methodist School where he wooed his fellow students through his singing before returning to Monrovia where he has began the process of fully launching himself into stardom with God’s grace. He has produced two albums, the first being ‘Noone Like U’ (8 tracks) in 2008 and the current thrilling one called ‘Jehovah Bless You’ (8 tracks) in 2013. His third (with another set of 8 tracks) will be released officially on June 4, 2014 to mark his 34th birthday. He had previously won Best Lyric Composer in 2008, Best Male Vocalist in 2009, and in 2010 and 2011 the Best Male Vocalist. Currently the President of the Music Ministry and Director of the English Choir at THT Church in Topoe Village in Gardnersville, Sayon Mayson’s favored musical sojourn is most likely to shoot upwards: “For now, Bro. Bayjay, there’s no turning back for me, by God’s special grace”, he concluded.